Based in Östersund, Jämtland, since its beginnings in 1969, Woolpower was originally called Ullfrotté and developed the then new material Ullfrotté Original in collaboration with the Swedish Army. brothers Daniel and Adam Brånby, who also own sister companies Gränsfors Bruk and Svedbro Smide. Their ideology permeates all three companies. They believe that their products should be manufactured in Sweden and that the knowledge and craftsmanship of their employees should be respected and preserved. Woolpower’s range of high-quality thermal wear includes base and mid-layers, socks, and accessories such as headbands, caps and gloves. Ullfrotté Original is made of a mix of fine merino wool and polyamide/polyester and is described as soft, warm, dry and durable – ideal for layers during outdoor activities. The wool of the fabric comes from merino sheep in Patagonia and is non-mulesed, guaranteeing ethical animal treatment. The company’s vision is to generate heat for 100 years and to continue to be the best in producing warm clothes, whilst also being a responsible company that cares for people, animals and nature. Woolpower has a long-term perspective on sustainability. The demand for high-quality and sustainable outdoor clothing is increasing, meaning that Woolpower is set to continue its successful journey. The company is proud of its skilled staff and transparent, responsible and ethical production. 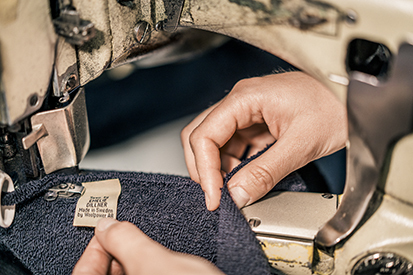 Each garment, for example, is sewn by one seamstress, who takes ownership and approves it with a personalised label. The company also recycles any leftover sewing fabrics into a felt material that is used to make insoles and sit pads.